The club’s Sales and Marketing Committee is pleased to announce details of the first pre-match lunch function of the 2017/18 season. A ‘Lunch with the Legends’ will be held in the Joe Bambrick Lounge at Windsor Park on Saturday 9th September ahead of the first Big Two clash of the season against Glentoran. 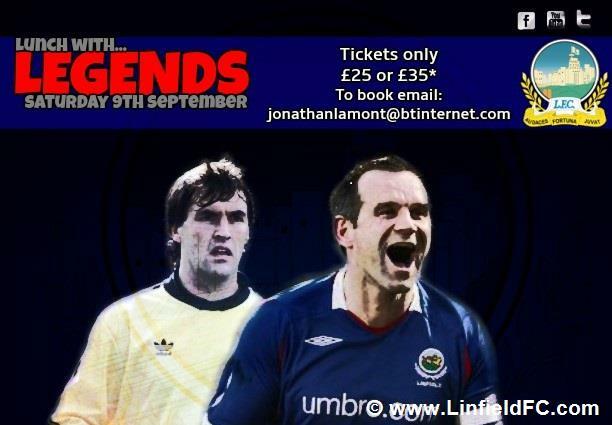 Linfield legends and former NI internationals George Dunlop and Glenn Ferguson will be the special guests with other former players to be confirmed over the coming weeks. Tickets for this event are priced at just £25.00 for Club Members and Season Ticket holders and £35.00 for other guests. This includes a two course hot buffet lunch, pre and post match bar facilities in the Bambrick Lounge and a corporate seat in the South Stand. Doors will open at 1.00 pm with lunch to be served from 1.30 pm. The bar will remain open after the game until 5.30 pm. Please contact Jonathan Lamont (jonathanlamont@btinternet.com) or any member of the Sales & Marketing Committee to reserve tickets for this event. Tickets will also be available from Stephen McKernin in the Windsor Superstore before Saturday’s Premier League game against Ballymena United.